The greatest museum ad of all time? I think this might be the greatest museum ad of all time – it’s from the 2008-2009 season at the Jewish Museum in Vienna, a superlative institution which I’ve written about before. Rather than present Austria’s Jewish community or Jewish material culture as the object of mainstream scrutiny or fascination, it focusses on the sense of wonder and discovery that visitors to the museum will experience. I love that a minority identity within a nation, especially one with as fraught a history as that of Austrian Jews, refused to be exoticised or presented as ‘the Other’ in the museum space, and instead turned the tables on the Austrian mainstream with this neat image. The museum has a great record as an institution which treats a rich, harrowing, and difficult history with verve, courage, and creativity. This includes the work of their marketing team as well as their excellent curation and events. The 2008-9 ad demonstrates how the ways in which an institution markets itself to the world can be as sophisticated, political, and compelling as anything done with that institution’s spaces, services, or collections. Paul Bowers is Head of Exhibitions at Australia’s Museum Victoria. During this week’s Museums Galleries Australia conference, Paul took time out to write a few words about the term “narrative”, currently in vogue among cultural institutions. Paul argues that narrative can be a dangerous label for cultural institutions to bandy about. “Narrative is singular, but the museum experience (stories, facts, things, people, audiences) is diverse”, he writes. He points out that few people experience a museum or exhibition as a defined story with a beginning, middle, and end. He reminds us that the museum is “conceptualised in law, policy, and culture as a never-ending entity”, unlike stories which come to a conclusion. We are often in a heroic genre – questing against ignorance. We have a lot of scientist-as-hero, in which they use effort, brains and a ‘magical agent’ (such as a DNA machine) to defeat ignorance. […] We should think about our character – are we Aragorn, Frodo, or Gandalf? The kingly hero, the ‘nobody’ with a heart of pure courage, or the wise one who initiates others into their knowledge? A museum could be all or any of these, but we usually default to being Gandalf without it being thought through. In a storyworld, the makers, the characters, the audience, are all together in enacting a story. They all believe. So I see that we need to place ourselves within a storyworld as well, not as simply the abstract producers of the product people come to see. If I use Dr Who as an example, when i read the comics, watch the TV show, buy the products or indeed do all three, I am having a consistency of engagement with the storyworld. Dr Who is always clever and kind. But I am not shut out of the TV show if I don’t read the comics. How do we achieve that – how can all our audiences feel part of one consistent ‘Museum world’ whether they attend everything we do or just visit the website now and again? And how does the storyworld idea promote continued and deepening engagement? I might watch a show on Netflix just because it’s part of the Marvel Cinematic Universe and I liked the Iron Man films. That’s very different from promoting a show to me, and I think it’s deeper than ‘brand loyalty’ – I’m not being loyal to the brand, I’m being loyal to a storyworld. Literature is an interesting metaphor. We try to think like novelists, or the great essay writers. But I think exhibitions are closer to poetry. Individual moments, brief and rich in meaning, clustered together in suite and bound together as one entity: exhibits as poems, an exhibition as a volume of poetry, and the museum as a body of work of a range of poets. But I’d point to another form, too: the short story. Deceptively similar to longer prose forms, the short story at its best manages to fold great swathes of experience and vision into a tiny textual construct. It is not a path from beginning to end, but a space which you can explore in different directions. Alice Munro imagines a story as a building to be explored, containing multitudes. And maybe museums, galleries, and libraries – all those cultural institutions which exist for their users to explore – could be like her stories too: not fixed paths leading us helplessly from beginning to end, but spaces at once familiar and surprising, ever enticing, comfortable enough to welcome us but challenging enough to merit repeat visits. Read Paul Bowers’ “On Misusing ‘Narrative’ In Exhibitions” here. On Monday, I start a new project with Dulwich Picture Gallery in South London. As part of the youth scheme NCS The Challenge, I’ll be helping a group of teen volunteers to create arts outreach activities for the Bermondsey Street Festival on 19th September. We’ll be drawing on art exhibited at Dulwich, but a gallery is as much about the relationships between culture and community as the items in a given collection – so we’ll also be looking at forms of original artmaking and play which Challenge volunteers will devise and deliver for the Bermondsey fair. Dulwich Picture Gallery has a proud tradition as the world’s first purpose-built public art gallery; I’m excited to be helping the gallery take public outreach onto the streets of London, in the same community spirit as Fun Palaces. Later this year, I’ll be running another event at Dulwich to tie in with their exhibition of works by M.C. Escher. Darran Anderson’s recent talk at the Victoria and Albert Museum reminded me of the importance of Escher as an influence on pop culture, especially computer games, and I’m excited to see the playful, pop-cultural approach Dulwich is taking with this exhibition. Find out more at the Dulwich Picture Gallery website. This is the first of a series of posts supporting my article on comics in the classroom, which appears in the June 18th curriculum supplement to the New Zealand Education Gazette. Find more posts on comics and education under the comicsedu tag on my site. 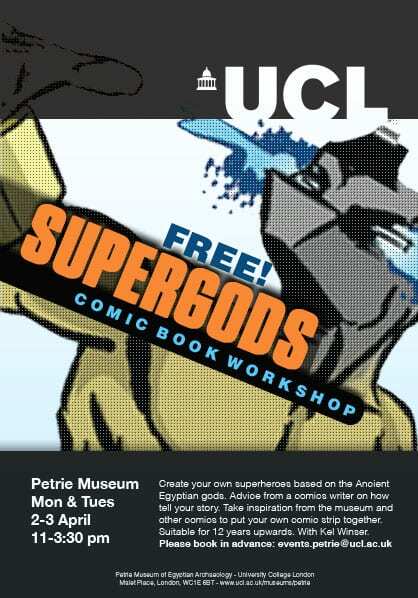 One of the most exciting comic book education projects I’ve discovered takes place in the Petrie Museum, where University College London holds its collection of archaeological findings from ancient Egypt. Image property of University College London. It can be a tall order attracting children and young people to an academic museum, especially with a capital city’s attractions on your doorstep. Since 2010, artist and educator Kel Winser has run workshops at the Petrie, using ancient Egyptian culture as an inspiration for children and young people to create their own superhero characters. Kel and the Petrie Museum’s education officer Debbie Challis joined me to discuss their innovative use of comics as an education tool.